Looks like one of my favorite Pistons is on his way out of town. 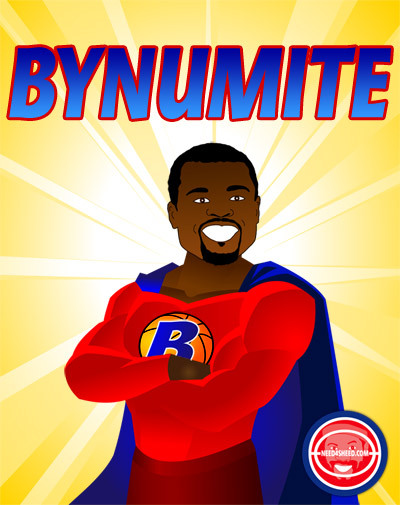 Will and his Bynumite antics will no longer be exciting crowds at the Palace. The Boston Celtics are working to finalize a trade that will send center Joel Anthony to the Detroit Pistons for Will Bynum, according to a league source. It’s not clear if Bynum will stick with the Celtics. It could hinge on whether the team makes any additional moves before the season tips later this month. You’ve got to believe if the Celtics release Bynum, someone will pick him up. As for Anthony, he’s not likely to get much playing time given he’ll be playing behind Drummond, Monroe, and Aaron Gray. 7 Responses to "Pistons Finalizing Trade with Celtics – Joel Anthony for Will Bynum"
Good luck to you and your next team Will. Thank you for giving 100% heart and effort every time you step on the Pistons court. Thank you Will for playing all 48 mins against Philly in the “Player Mutiny” game. Ahh, the ‘Player Mutiny’ game…. I am still so upset by this. Doesn’t help that I really dislike anthony. we are gaining a player who is roughly 1mil more than bynum and yet bynum equTes to more than half of anthonys rebounds. Why did we target a ANOTHER backup C over a backup PG. Even with gray out I do not like this move and our preseason has not been putting of my fears to rest. Just another season as a Piston fan. i wouldnt be if i were u its svg type of player stretch 4 it was obvious he ll take a player tzhat can perform abd obviously anthony was available not too happy but hey i d like if we could get that guy from orlando thats now in hornets (cant remember the name lol) but pistons will survive hopefully joel anthonyy what worries me is that pistons nation is celebrating pre-season win against sixers and noone but me (looks like it) is asking WTF did the sixers score 103 points!!!!!!????????????????? 2) jennings looks 100% better this year. again I think it’s svg. augustin looks great too. 5) we have three point shooters. it is going to rain from downtown and that’s good because 3 points is more than 2 and the league is changing. 3 points is where the future is, even the cavs know that. 7) this team is young and hungry and is going to eat other teams alive. This is our year. It’s been worth the wait, let’s go pistons! !